How can I point my website to another server? 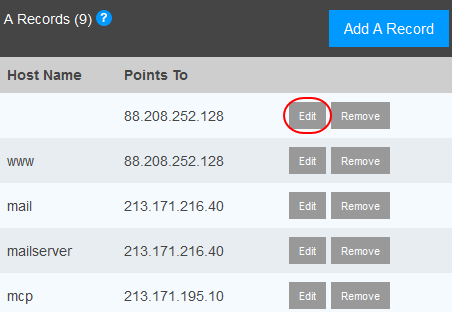 You can point your web site to another server by creating an A record within the Advanced DNS settings of your Control panel. This is not the same as forwarding your website to another website, which is covered in our article: How can I set up website forwarding? 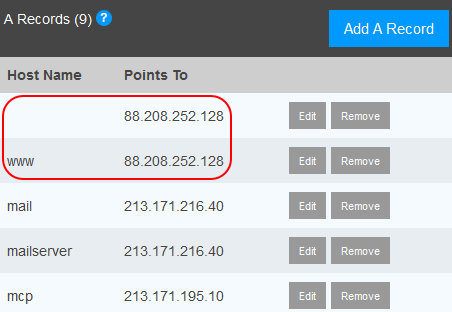 An A Record is a DNS record that allows you to point a domain name or subdomain towards a specific IP address. 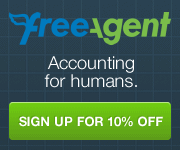 This allows you to host services (such as a website or subdomain) in a different location. While most services will only have one A record associated with them, websites are the exception. These days it is common to change the root record and the WWW record to point towards a domain’s webserver. This ensures that customers entering http://domainname.com or http://www.domainame.com will both be forwarded to your webserver. In the following example we have forwarded website enquiries to the server 88.208.252.128. 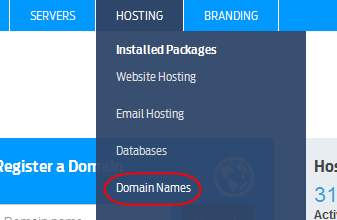 Log in to your control panel and select Domain Registration from the Hosting menu. A list of your domain names will appear. Click on the domain you would like to point elsewhere. Click the icon marked Advanced DNS. A list of your DNS records will be shown. Click the Edit button next to the root A record (this is the record with no Host Name value). Enter the IP address of your webserver in the text box provided, then click Save. 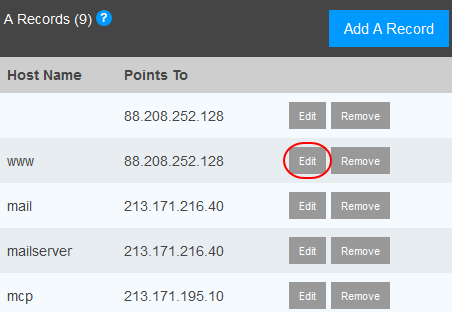 If you are pointing the A record towards your Fasthosts webserver, the IP address of your website can be found within your control panel. Don’t forget to update the root and the www record. Additional A records can be set up for other services. 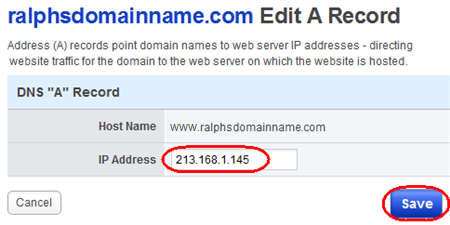 Our article How do I point my domain to Fasthosts if I’m using external DNS? will provide more information. Both records will now point your website towards your new webserver. Due to propagation it may take several hours for the changes to fully take effect.